Prepaid money cards have become increasingly popular these days, due to the rise of online shopping, their accessibility for those who prefer not to carry around cash or have access to credit cards, and their relative ease of use. Unfortunately for the rest of us, online fraudsters are all too aware of how easy they are to use. Since these prepaid cards are hard to track and they provide a convenient one-off method of transferring cash, criminals are starting to take advantage of these cards – and using them to take advantage of you. This is a major concern, seeing as the use of these cards is growing exponentially; according to the Mercator Advisory Group, Americans are expected to put $80 billion onto these cards this year – that’s double the amount from what consumers were putting on them just four years ago. 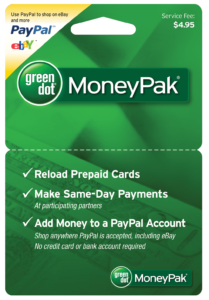 MoneyPak, one of the most popular prepaid card products being sold right now, is based on a simple concept: consumers can buy them at local retailers, load hundreds of dollars onto the prepaid card, and then use the access code on the back of the card to transfer the money onto another prepaid card or an online account, such as PayPal. Since MoneyPak cards have become popular, fraudsters have been taking notice of this convenient process and using them to con people online. Their schemes often involve the fraudsters posing as bill collectors, government officials, sales agents, and the like and contacting potential victims through emails, online advertisements, or phone calls. They will then instruct their victims to go to one of the big retailers that sells MoneyPaks and ask them to put hundreds of dollars on the card. Then, all they have to do is email the 14-digit access code on the back of the MoneyPak and the fraudster will immediately have access to the money on the card, and can then easily transfer it to their own online accounts. Fortunately, the maker of MoneyPak is entirely aware of this issue. Greendot, the largest provider of reloadable prepaid debit cards, has taken notice of their consumers’ complaints and decided to replace the MoneyPak with a more secure process. This process will allow consumers to directly add money onto their existing prepaid cards by simply swiping it through a card machine connected to a Green Dot data-processing center, bypassing the intermediate step of using a MoneyPak altogether. The company is hopeful that this new process will better protect their consumers from fraud. In this case, it’s a good thing that Greendot took notice of the fraudulent practices going on with their product and took actions to prevent further fraud – but only after these schemes already cost MoneyPak consumers $30 million in 2013. Protect your workplace from any potential wrongdoing before it takes place by implementing a third party ethics reporting system today. An independent ethics reporting system will give you and your employees a safe place to anonymously report any concerns they may have, without any threat of repercussions.